JOHANNESBURG, South Africa, January 12, 2019 – Atop a plateau that Zulu tribal people once called “The Place in Heaven,” the distant beat of djembe drums became a celebratory symphony of rhythm that set a week’s worth of glorious festivities into motion. 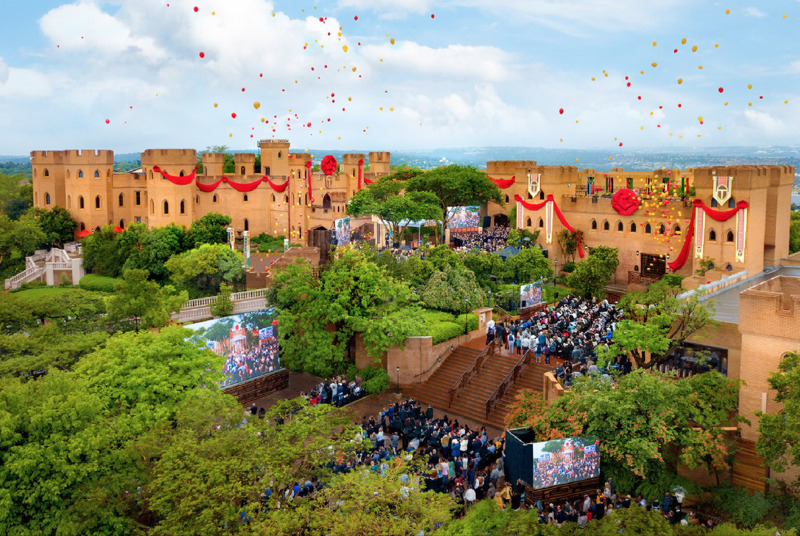 More than 4,000 guests from all over Africa and every corner of the globe had gathered at the magnificently restored Castle Kyalami for a historic Grand Opening ceremony. It was a celebration filled with pride and passion, a celebration of continental hope uplifted, a celebration of spiritual freedom and yet another milestone in the history of the Church of Scientology—a new Advanced Organization and Saint Hill for Africa. For eons, this sacred hilltop at Midrand has overlooked the vast and rich lands of South Africa, a vision spanning endless miles in all directions. Now it offers a different sort of vision, one extending even farther than the eye can see, into a new spiritual realm. At the center of that heavenly hilltop, on 22 acres of land, the 87,000-square-foot Castle Kyalami stands in testament to the religion’s commitment to helping create an Africa that can fulfill its unlimited potential. The Castle’s presence reflects the magical aura of the South African landscape as it looks toward the nation’s twin giants of Gauteng—Johannesburg to the south and Pretoria to the north. The panoramic views quickly captivate visitors, and the Castle’s 12 crenelated turrets and eight-inch-thick walls give it a unique ambience. The elegant interior augmented by Italian marble floors, mined from the same quarries used by Michelangelo, lent its own special atmosphere to the spectacular grand opening. The inauguration of the Advanced Organization embodies the realization of a dream first expressed in 1966 by L. Ron Hubbard, Founder of the Scientology religion. He sought to bring the messages of Scientology on human rights and social betterment to the land of apartheid—where, at the time, and for three decades to come, freedom was only a dream for tens of millions of Africans. Here Scientologists throughout the continent will find Scientology services allowing parishioners to advance their spiritual journey to the upper reaches of the Bridge to Total Freedom and right on African soil. The expansive facility includes a Hubbard Guidance Center spanning an entire wing for auditing (spiritual counseling), an Academy for the training of auditors to serve in Scientology organizations across Africa, as well as an entire division for the guidance of parishioners at the Advanced Levels of the Bridge. Beyond the spiritual work of the Church within the new Advanced Organization, the day also saw the simultaneous dedication of a Continental Liaison Office for ecclesiastical management of Scientology across the region. This is a generation point providing a vital link between the Church and religious, civic and social organizations across the African continent. From here, the Church will coordinate social and humanitarian outreach programs already reaching hundreds of millions in the name of a drug-free, crime-free, moral and just world. In fact, in combination with Castle Kyalami, the liaison office represents a dynamic hub of humanitarian aid that, in addition to broad-scale initiatives, will see to the hosting of seminars and events focused on coalescing community and interfaith forces to address social ills that are so often ignored. The Grand Opening ceremony itself dug into the Church’s deep well of social partnerships in Southern Africa. Dignitaries welcoming the crowd and honoring the Church included Brigadier Sthembiso Shobede-Nkosi of the South African National Police; Apostle Matome Modiba, Executive Secretary of the National Interfaith Council of South Africa in Gauteng Province; Michael Tshishonga, the nation’s former Deputy Director General of Justice; and the Rev. Gift Moerane, Secretary of the Council of Churches in Gauteng and advisor to the South African National Peace Accord. The Rev. Gift Moerane, whose work as an adviser in the South African National Peace Accord first put him in touch with the humanitarian work of the Scientology religion, said he considers L. Ron Hubbard’s writings as a guide to better lives throughout Africa. The Grand Opening of the Advanced Organization was the crowning achievement of an era of global expansion and the kickoff to a week of jubilant celebration. Day after day, music was in the air as African singers, drummers and dancers entertained the global gathering of Scientologists and local guests, on outdoor terraces throughout the 22-acre estate. International guests were given a taste of South African culture and cuisine with an on-site African marketplace featuring handcrafted jewelry and crafts and traditional braais (South African BBQ). And the week offered a series of special events, which drew tribal chiefs, humanitarian champions, as well as local and international Scientologists. Exhilarated after the historic Grand Opening and energized to build on the momentum of the day, Scientologists from across Africa gathered to plan for future expansion throughout the continent, with new Churches on the horizon in Port Elizabeth, Durban, Cape Town and also in Zimbabwe, at Harare and Bulawayo. South African stalwarts of the International Association of Scientologists (IAS) took center stage for the first-ever African IAS Patrons Ball. The room was transformed to golden glory with shimmering backdrops and protea-filled floral arrangements for the black-tie gala. Mr. Miscavige honored over 100 IAS members for supporting the continent’s massive humanitarian outreach, and acknowledged their drive and dedication in helping to make this Grand Opening celebration a success. The pride was palpable as these dedicated Scientologists accepted their awards. After a sumptuous dinner, musical stars rocked the room. Caribbean sensation Michele Henderson and Harlem’s hip-hop legend Doug E. Fresh set the beat for the rest of the evening as the Patrons got down on the dance floor and partied the night away. The Africa Humanitarian Crusade Seminar, attended by hundreds, spotlighted the Church’s community outreach programs. Attendees were enlightened and inspired by a series of in-depth briefings outlining the nuts and bolts of some of the world’s most far-reaching social salvage initiatives. The collective focus shined on Africa, putting into place plans to address the continent’s many social problems, offering hope to help reach its unlimited potential. The weeklong celebration culminated with the Church’s very first Sunday Service, which got off to a joyous start with the sound of an a cappella choir from Soweto. The moving service, which included an ordination ceremony, was a testament to L. Ron Hubbard’s vision for the continent, bringing together African royalty, community leaders, local Gauteng residents and the congregation of Scientologists. It was a fitting close to a historic week, filled with the spirit of hope and the promise of a brighter future. The dedication of the Advanced Organization and Saint Hill for Africa underscores what is a massive period of epic expansion for the religion in just the past 15 years. Under Mr. Miscavige’s leadership, the Church of Scientology has opened the doors of 70 new Churches of Scientology across six continents. Recent openings have taken place in Salt Lake City, Utah; Silicon Valley, California; Perth, Western Australia; Orlando, Florida; Stuttgart, Germany; and Detroit, Michigan.